Last year I watched Verve Painter demos on youtube and I immediately thought it was a pretty nice dynamic of fluids painting app, capable of doing amazing stuff, So I gave it a try. Last edited by eduardobedoya on Sun Feb 10, 2019 2:34 am, edited 5 times in total. great computational fluid dynamics, not exactly as oil, but it can certainly achieve oillike media (in the thick better than in the thin paiting). 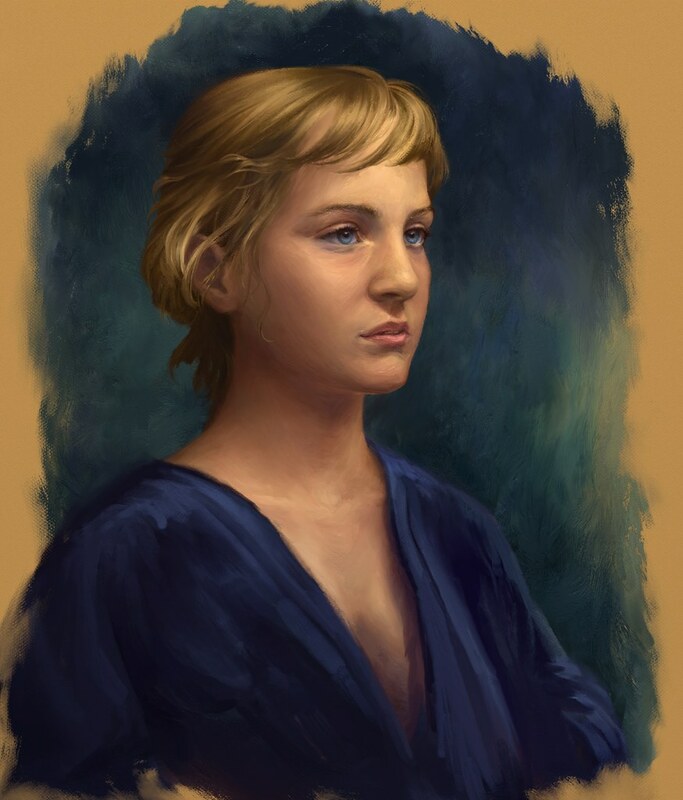 I tried to achieve realism over appealism as a test, but w Verve Painter the brush strokes can get really expressive. thanks and congrats for the amazing app Taron. Last edited by eduardobedoya on Fri Jun 02, 2017 4:10 am, edited 1 time in total. Ah, you're blowing my mind, Eduardo! Fantastic work, very beautiful, very convincing, particularly in terms of painting. I'd dare anyone to guess this is a digital painting! As for your concerns, Oh, I know what you're saying, though, I also know that you will find ways to approach blending in Verve, which make it easy to get soft blending, but there will also be a trade-off. However, I will most certain keep working on the substance, which is likely most responsible for the brush to paint behavior and deserves more work for sure! I work tend to switch between smudge [shift] and average [ctrl]+[shift] when it's meant to get really smooth, but you want to have Opacity on Pressure for that! My left hand's fingers always hover over these keys [ctrl, shift, W, E and space] occasionally holding down [shift]+[F] to adjust fluid smudge amount and also [shift]+[B] to toggle build-up amounts between none and what ever feels right at the time. Also, I tend to start paintings in (=) mode, which I used to have on by default, but switched it back to the original (>) mode that builds up paint. Very, very often, when I want to do a controlled painting with less experimental aspects, I never turn fluids on for a whole session, haha, but almost as often I use a tiny amount of fluidity, just to get the substance smooth and thick. So, yeah, just like ArtRage, which really took some time to get a feel for, Verve will also take some time, but there's something about it...the immediacy, the behavior and focus, I don't know, it becomes something real in its own rite. It sure needs a lot more development and has much greater potential, of course. I'm on it! But for now: YOu ARe FANTASTIC! And so very welcome to the forum!!! I consider Verve Painter one of the best natural media paiting apps around. Hope you'll find this sort of mini wish-list worthy and don't bother if I compare Verve Painter with other painting packages. I understand and recognize the worth of the modifier paradigm (smudge, average, erase) since sometimes you want to quickly switch between tools, also the way you let each brush became whatever tool is needed, leaving all chances open to the artist, is just amazing. But I used the modifier paradigm IN CONJUCTION with the "tool mode" version of it (smudge, average, erase) by clicking in their respective circular icons in the bottom right corner of the screen, so I think those Icons should also have their own hotkeys, (eg. B for paint mode, V for smudge mode, R for erase). Both modes are very compatible, e.g. in some painting apps n 3D packages as well, you can completely switch to a tool "Brush" by pressing down and quick release "B", but by holding down "B" (for more than 150 millisecs) it will temporarely switch to "Brush" until you release "B" key so then it return to the last used tool, and the same goes for all the most used tools. So in other words I suggest modifier paradigm should use Letter keys as modifier keys instead of the real modifier keys (Shift n Ctrl). Man, I love the program, but it really tooked me a while to get used to the navigation keys and it totally twisted my brains since EVERY other painting app use the SPACE key to PAN, and CTRL SPACE combo to ZOOM, man the package is very inventive and creative, and its good to be so, but why changing the default navigation keys that are UNIVERSAL for ALL painting apps? does it has something to do with the SHIFT CTRL keys being used for the Modifier Paradigm? I love both Photoshop n ArtRage color pickers cuz they are BIG so you can clearly see every subtle change in the HUE/LIGHT/CONTRAST gradient in a very large range, Verve Painter color picker is waaay too small, really tiny, and yet it shows the hole color spectrum (not just the LIGHT n CONTRAST) compressing the hole SATURATION gradient inside a tiny 50 pixel radius. All the time I just wanted to increase the SATURATION 2% and I winded up warming the color and increasing the SATURATION by 10%. I know the color picker includes sliders for LIGHT n OPACITY, but tweaking SATURATION in realism is very very important and needs to be done all the time, tweaking SATURATION in Verve Painter was really daunting, I know there is a SATURATION wheel in the right side panel, but it has a bug, it always jumped directly to 100% when trying to tweak it (if I have previously tweaked the RGB wheels). Please "On the fly" Color Picker should be 10 times larger and should include a SATURATION slider, if it could include a view mode (LIGHT SATURATION mainly/ HUE LIGHT / HUE SATURATION) it would be perfect. Btw opacity slider could use Photoshop and Painter hotkeys 0-9, I'm sure every PS/Painter user will be very grateful. is it just me or Verve Painter has a canvas size limit of 2300 pixels height? Every time I tried to expand the canvas beyond that it totally turned black, and program crashed. I yearned for a 9000px height canvas. Again Taron, thanks for this groundbreaking app, please look at these lines above as some sort of fan wish-list. It is my desire to eventually allow for a great deal of customization, just so people can alter it to their habits. Mobile platforms will have again different needs, so there's still a lot to break into. What you're describing with the click versus holding a key I already have in there for the color picker [c]. Have you tried it? I like it, though it sometimes catches even me by surprise, haha. Anyway, my general hotkey style comes from 3d apps, since I come from these environments myself. I know, it's a little daring, but there's something to be said about consistency between interdisciplinary workflows. I priorities 3d, because you have to spend a lot more time in them, compared to painting, if you work in both fields. Thus a temporary switch to painting is not as puzzling. ALSO even other pattern related apps such as music sequencers have similar modifier implementations. HOWEVER, to me the most relevant thing was manual comfort; how does it feel to use the tool. I'm familiar with the need to bounce around the keyboard for all the basic features of painting and found that to be wanting. So I went for an approach that allows you to keep one hand rather still and in place, while your painting hand can get all the focus, yet, you can swiftly alter your paint mode without having to reorient yourself on the keyboard. At the end, it's a matter of anyone's own comfort, of course, though, I can recommend giving it a long and patient try, because out of my own experience I very much believe in it and I've been working in this field for nearly 30 years with 25 of them on apps like photoshop and such. Not sure what difference it makes, except that I can assure you that my choices are not random. Color Picker is the fun part of future developments, because I think there's a lot to be discovered in terms of great innovations and practicality. SO, Absolutely! But for now, try holding down [ctrl] while your on the color picker! It will lock the color you're on and you can move it just on saturation only. Holding down [shift] will lock saturation and you can rotate through the spectrum only. This stuff is still a little flimsy I notice...not sure what nonsense I've done there, but I'll fix it for the next release! Currently you almost have to pick the color on the color picker before you can lock it in place. If you just pick a color from elsewhere and then try to lock, it will lock on the previously locked color...so you'd have to first confirm the color you've changed to by picking it on the color picker and then you can lock it...very, very stupid. I'm sorry! And the precious resolution madness. Pfffff....it's so hard, Eduardo. Verve is an openGL based performance app, which requires a single buffer to be used for a fluent behavior. I could try and break up the canvas into several texture images, but that quickly becomes fairly slow and could cause all sorts of troubles. Maybe, when I make a pro version, I can setup a system of that kind, but it will require very serious hardware, I'm afraid. On the other hand, the closer mankind advances towards the so-called singularity, the lesser this becomes an issue, hahaha. ...for now, you can only go as high in resolution as your graphics card permits. I didn't put any safety measures in there, because I'm a ruthless slob and decided for speed instead of safety ...but I'll strive to find a healthier compromise as well. Lots still left to be learned, you know. I virtually threw myself into the cold water back then, doing all the wicked GLSL work Verve was pushing me to explore and invent. Anyway, I've got an NVidia GTX 970 for about $300 at the time and can go to 4000x4000 and still work it (with its fans mildly moaning). I don't ever work in such resolutions, but even the fluids still work adequately and you can still work with a brush of the same size at still about the speed one might be used to in other apps, haha. ...though rather sluggish. BUT, I will try my best, I promise you! I've done something else a while back, which is kind of fun and could become interesting as well, which is to record all your actions, which you can than replay in any number of ways, from painting with your recording as it plays to playing it back at any size or rotation of your liking and so on. The size is tricky, because for it to perfectly translate, I will have to figure out fluid consistency when scaled, but then it might be possible to work in the lower resolution and then playback for print resolution matters, you know! Could be cool. But it would just be a work-around for higher res, of course. I will continue to explore proper solutions! Color Picker: Desired and Coming! While most of my text read like an excuse, it was not meant as such, but to inspire. I agree with and understand your practical and helpful considerations and feel and see clearly that it all comes from an active artists experience, which I love! THANK YOU! Very Welcome Fantastic nice portrait - this looks so great. Graet news from you too, dear taron. Blender/Modo/Zbrush/Maya have all different navigation hotkeys, well Blender have two hotkeys configurations one of which is as Modo, but most of them are different and most important they offer options to change their navigation hotkey configuration so they can emule other 3d packages navigation. So I think there isn't really an universal navigation hotkey configuration for 3D really, but there is for 2D painting apps. So I'm acostumed to switch hotkeys when in 3D but not when in 2D, I guess in the end it's all down to personal preference. However it would be nice if Verve Painter could have two navigation hotkeys configurations too, like Blender, Maya, and the "killed" Softimage have. I insist on this cuz all 2D painting applications that I know don't offer this feature, so they only have one single navigation hotkey configuration, hope this won't be the case for future Verve Pro. About tiny color picker. You made me thinking. While verve is active, you can color pick everywhere on your canvas by just hoovering over and press ALT. 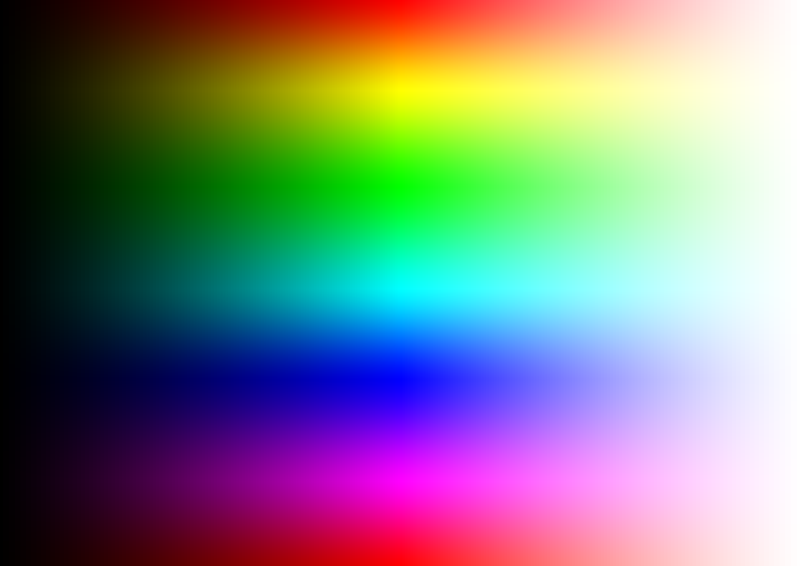 What if you just take a big picture of a hue, brightness, saturation spectrum and place it on your desktop. On a two monitor setup with one monitor filled with gradient picture you can be extremely precise. Sure it is missing a reference circle to represent actual color, what makes it more difficult again. Looking forward to see more work as this picture is fantastic. I would like to be able to do a "color shifting", is a very common paiting practice, all subtle changes of desaturated colors wouldn't fit inside a pallete, I think tha's why color pickers are interactive. but this is a sort of tribute to my people struggle. Critics are very welcome (needed). Last edited by eduardobedoya on Tue Mar 21, 2017 10:45 pm, edited 1 time in total. Wonderful, Eduardo! My sympathies to the affected people. I know they will pull through and they will be able to reshape their land. I hope, they will gather enough energy, when it's all over, to use this chance to start anew, but be careful not to be taken advantage of. Everything about your portrait there speaks volumes and engages empathy. It has anger, sadness, frustration, but also strength and faith. It looks like he is staring back at the dark, stunned by its ruthlessness, helpless where he sees it, but ready to resume life and raise it from his shadow, cast by the light above.